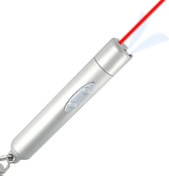 This combination LED light and laser pointer offers incredible versatility in a compact design. The super bright LED provides thousands of hours of life. The white LED is a high intensity white light. Great for emergency situations or any time you just need to have a light handy. 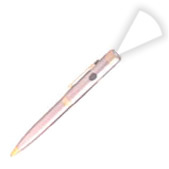 The laser pointer is perfect for presentations or simply highlighting things of interest. Comes with a convenient keychain. Now you can carry just one tool for both lighting and pointing needs.